SynaptiCAD recently released version 12 of WaveFormer Pro and DataSheet Pro, its premier timing diagram editing and waveform translation products. Version 12 includes over a dozen new features to improve the timing analysis engine, timing diagram documentation capabilities, and waveform translation support. A number of improvements were made to the internal timing analysis engine to speed up timing calculations, provide more insight into how the calculations are performed, and to ease optimization of critical timing paths. Computation of timing constraints in diagrams with many timing parameters was speeded up so that timing diagrams render faster. Text-based timing analysis reports can now be generated that show the formulas used for each edge and timing parameter calculation in a timing chain. Delay correlation calculations were also added for clock buffer delays, allowing less pessimistic timing results for clock buffers with low skew. DataSheet Pro v12 adds several new documentation capabilities, including the ability to embed logos into timing diagrams, draw curved timing parameters, draw boxed text objects to highlight points of interest in a diagram, and generate common analog waveforms (e.g. ramps, sine waves, and capacitive discharges). Image support was also added for the new XML-based Scalar Vector Graphics (SVG) format. The waveform viewer was tweaked to convert single-bit signals to buses faster, enabling much faster loading of Verilog VCD and logic analyzer data files (up to 10x faster in many cases). Rendering and scrolling of bus data was also speeded up significantly. Enhancements were also made to WaveFormer's waveform translation engine that converts between simulation waveforms, HDL stimulus, logic analyzer waveforms, and pattern generator stimulus. Verilog and VHDL test bench generation was speeded up by a factor of 20 for large waveform files. Support was also added for reading as well as writing Agilent 16720A pattern generator stimulus files. WaveFormer Pro is available on Linux, Solaris, and MS Windows (including MS Vista). A perpetual license sells for $2500 node locked on Windows. 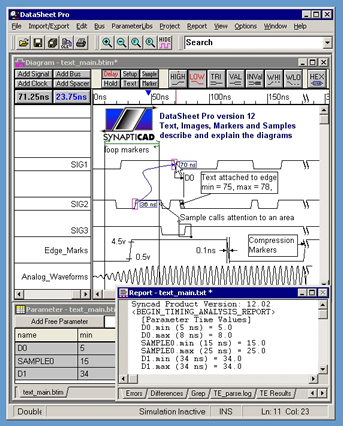 SynaptiCAD also sells DataSheet Pro (an upgrade to WaveFormer that includes the ability to embed linked OLE images into documents and supports editing multiple diagrams simultaneously), and Timing Diagrammer Pro (a reduced version of WaveFormer without the waveform translation features). For any questions concerning this press release please contact Donna Mitchell at 540-953-3390 or email at donna|at|syncad.com. High resolution images can be downloaded directly from SynaptiCAD's web site at www.syncad.com.